In addition to our traditional treks we offer a variety of tailor-made horseback rides. If you've perused our web site without finding a trip that matches your wishes, let us know and we'll be happy to plan a unique horseback ride for you! Our network of trails and campsites is intricate and broad which allows to combine different routes and accommodation options to suit your preferences. If you prefer cabins over tents, or clear mountain lakes over natural hot springs, we can easily tweak an already existing itinerary to make your adventure in the Chilean Andes perfect. Tailor-made treks require a minimum of 5 riders. Don't hesitate to contact us! 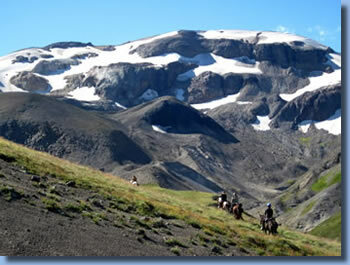 Pack trips, and combination pack-and-cabin trips, can be arranged in the following areas: National Park Huerquehue - Rio Blanco Hot Springs – Reigolil Valley - Llancalil - Pangui - National Park Villarrica We can arrange open rides, to which other riders may join or closed rides which would be for your party alone. Check examples of rides we did for bigger groups. In addition to our standard trail rides, we may offer special rides in any given year. They may be exploratory pilot tours or follow different/ longer itineraries, and, more so than our regular treks, offer a unique, unrepeatable experience. Special trail 2019/20: Family trailriding Crossing the Andes Chile + Argentina + Glacier trail. On our stanard rides we take only adult riders; over the years we always have families requesting rides and usually we organize closed trips for them. This year we will do two trailrides open for families with kids - minimum age is 10 years. Enjoy some impressions of our horses: the morning on the paddock, ouit riding and finishing the evening on their mountain pasture. A video by our guide Lotte.